So you have boneless, skinless chicken breasts. How many ways can you prepare it so it's something new, something exciting, something tasty? If you're like me and are always on the look out for a new recipe using boneless, skinless chicken breasts, here's one to check out. 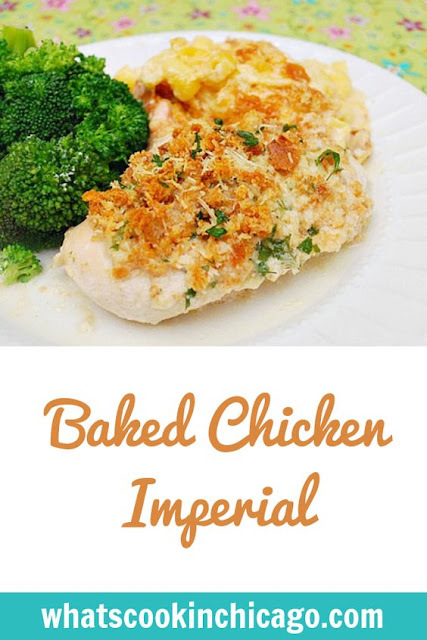 Baked Chicken Imperial is made with chicken breasts brushed with butter, topped with a savory Parmesan and herb breadcrumb mixture and baked in a bath of cream, chicken broth, wine and mustard. 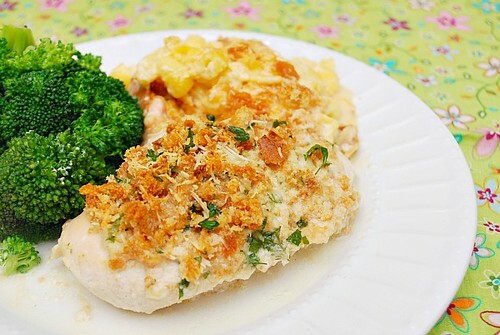 The result is a one pan wonder of tender, juicy chicken with a crunchy topping. Yes, you read right - one pan! A couple of things intrigued me about this dish. One, I liked how it was a delicious way to prepare the ever popular boneless, skinless chicken breast. Two, the entire dish is made in one pan, which means easy clean up! And three, this can be made in advance if need be. To make in advance, rather than using a skillet, place the chicken in a baking pan instead of a skillet and following the recipe below up until you add the liquid to the baking pan. You can cover and chill the chicken at this point and prepare the chicken broth & wine mixture just before you're ready to bake. Once the chicken is done, remove from pan and transfer pan liquid to a skillet to reduce or thicken to serve with the chicken. Sure, it means you dirty up another pan, but it's a great make ahead meal! Sprinkle 1 1/2 teaspoons of salt over the chicken, cover with plastic wrap, then place in the refrigerator while you prepare the breading. Preheat oven to 425 degrees f.
Process the bread in a food processor until coarsely ground. Add the Parmesan, 3 tablespoons softened butter, 2 tablespoons parsley, garlic, thyme, and 1/2 teaspoon ground pepper. Process until fully combined. Pat the chicken dry, and season with pepper. Arrange chicken in an cross shape in a large skillet (narrow ends in the middle of the pan, skinned side up). Brush chicken with butter, then pile the bread crumbs on top evenly. Whisk together cream, broth, wine, shallot, and mustard. Carefully pour 1.5 cups of sauce into the pan around the chicken breasts. Bake 30 to 35 minutes in preheated oven, until crumbs are golden brown and chicken is cooked through.Gently remove the chicken from the pan; cover loosely with foil. Add the rest of the sauce to the pan, whisk together, and bring to a boil over medium high heat. Cook until thickened (about 5 minutes), remove from heat, and season with remaining parsley, salt, and pepper. This is very good. I added more mustard because I think mustard makes it. Served it at a dinner party and everyone raved.